Dec 6 Updates: Ruby or Hagupit back as Super typhoon as it intensifies friday night. According to JTWC, Ruby has 240kph wind and gustiness up to 296kph. 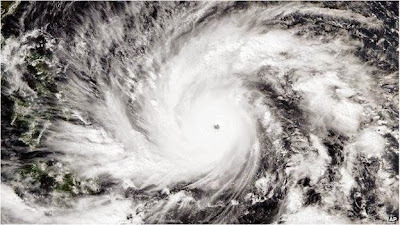 JMA tagged Hagupit as violent typhoon packed with 250kph of winx and 305 gustiness. Ruby still moving slowly west northwest with 15kph. State weather bureau PAGASA, in its latest bulletin issued 11 p.m. Friday night, raised public storm warning signal number 3 over Northern Samar, Eastern Samar, and Samar provinces. PAGASA said the 3 areas will experience winds of between 101-185 kph in at least 18 hours. PAGASA said typhoon Ruby was still packing 195 kph maximum sustained winds near the center and gusts of up to 230 kph. It expects the tropical cyclone to make landfall Saturday night or Sunday morning over the Eastern Samar-Northern Samar area.